The social world is saturated with powerful formations of knowledge that colonise individual and institutional identities. Some knowledge emerges as legitimised and authoritative; other knowledge is resisted or repressed. 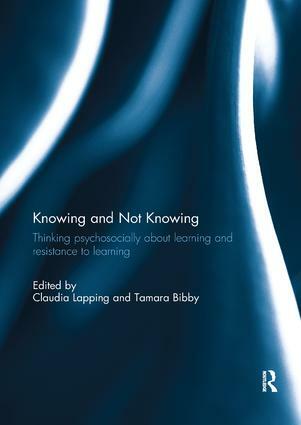 Psychosocial approaches highlight the unstable basis of knowledge, learning and research; of knowing and not knowing. How do we come to formulate knowledge in the ways that we do? Are there other possible ways of knowing that are too difficult or unsettling for us to begin to explore? Do we need the authority of legitimised institutions and regularized methods to build secure knowledge? What might it mean to build insecure edifices of knowledge? How might we trouble notions of knowledge in processes of teaching, learning and research? This collection addresses these questions, drawing on a range of psychoanalytic and social theory, from Bion, Freud and Lacan, to Derrida, Kristeva and Zizek. Showcasing work from North America, Europe and Japan, contributors explore writing as a practice that can stabilise or unsettle subjectivities; the unconscious relations between school practices, subjectivities, educational spaces and ideologies; implications of the productive energies and the deadening inwardness associated with mourning and melancholia for formal and informal learning; and the authority we invest in apparently rigid or ephemeral institutional spaces. Strongly empirical as well as theoretical in approach, this collection will be of interest to students and academics seeking ways to resist normative orders of legitimacy and coherence in education and research. This book was originally published as a special issue of Pedagogy, Culture & Society. Claudia Lapping is a Senior Lecturer in the Department of Culture, Communication and Media at the Institute of Education, University College London, UK. Her main research interests are the sociology of knowledge, reflexivity, and the use of psychoanalysis within empirical social research. She is author of Psychoanalysis in Social Research: Shifting theories and reframing concepts (Routledge, 2011); and of recent journal articles in Psychoanalysis, Culture and Society and Qualitative Inquiry. Tamara Bibby is a Senior Lecturer in the Department of Early Years and Primary Education at the Institute of Education, University College London, UK. She has a background in primary education and is particularly interested in psychosocial dimensions of student and teacher experiences of learning. She is currently completing an ESRC funded seminar project: ‘Bridging the Structure/Agency Divide: Interdisciplinary Approaches to Disadvantage and Education’. She is author of Education - An 'Impossible Profession'? : Psychoanalytic Explorations of Learning and Classrooms (Routledge, 2010); and of a recent journal article in Psychoanalysis, Culture and Society.